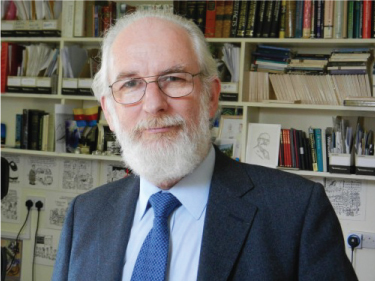 In the second installment of 7 Questions to a Linguist, ALTA Language Services had the pleasure of catching up with language scholar, writer, lecturer, and broadcaster David Crystal. Professor Crystal has authored and co-authored more than 100 books that cover a generous swath of the field of linguistics, focusing in particular on its applications to educational, clinical, and therapeutic contexts. In addition to founding the publications Journal of Child Language, Child Language Teaching and Therapy, and Linguistics Abstracts, Prof. Crystal is the president of the UK National Literacy Association and an honorary vice-president of the Institute of Linguists, the Royal College of Speech and Language Therapists, and the Society for Editors and Proofreaders. For his services to the English language, Prof. Crystal was awarded the Order of the British Empire in 1995, and in 2000 was made a Fellow of the British Academy. 1. What are a few of the pivotal moments that shaped your work in its early stages? I had the good fortune to do a first degree (at University College London) in which language and literature were equally balanced, and I fell in love with both. A consequence of this was an early interest in stylistics, both general and literary. Moving to Reading to help set up its first Department of Linguistic Science in 1965 was certainly a pivotal moment. Several other departments of the university were keen to collaborate with this new subject, and the result of that was an opportunity to apply linguistic ideas in such domains as the teaching of reading, child language acquisition, and speech therapy. And because the new undergraduate degrees needed introductory materials, the courses I found myself teaching fueled several general books, such as What Is Linguistics? (1968) and the Penguin Linguistics (1969), influencing my subsequent career as a writer. There are some similarities. My main work over the past few years has been in applying linguistic ideas to Shakespeare, first in vocabulary with the glossary Shakespeare’s Words, co-authored with my actor son Ben, then phonology with Pronouncing Shakespeare, published in 2005. It’s the phonology work that takes up most time these days, as the interest in what is called ‘original pronunciation’ is now worldwide, and companies in several countries have been putting on productions of plays using this approach. Well, it depends on what you mean by ‘unsuccessful’. On my bookshelves I have introductions to a couple of dozen languages that I spent many hours learning, at one time or another, often from a BBC audio course. I am fluent in none of them, but I like to think I would ‘get by’ if I found myself in a place where they were spoken. The linguist in me wants to encounter as many languages as possible, to the extent that I can handle the phonology, the basic grammar, and a simple vocabulary, and this was a teaching strategy we used at Reading when working with linguistics undergraduates. We called them ‘language practicals’. A class would meet an informant for an hour or so each week for a term. The informants were instructed to use only their mother-tongue in class, and the task for us all was to learn as much about the language as possible in the time available. It’s remarkable how much one can acquire in a short time using field linguistic techniques. After ten weeks, we were able to carry on a basic conversation. Those linguistic experiences have long disappeared from my memory now, though I like to think that they might still be neurally lurking somewhere inside my head. I can think of only one period, which was in the early 1980s when the Thatcher government was imposing cuts on higher education. Year after year, staff were asked to take early retirement, and many did. Those of us who stayed immediately found ourselves having to shoulder extra administrative and teaching loads. It drastically reduced my productivity as a writer. In 1980 I had been commissioned to write the book that would become The Cambridge Encyclopedia of Language, but by 1983 I’d managed to write only a few pages. That was a hugely frustrating time. In 1984 I had had enough, and resigned from my post at Reading to follow a career as an independent scholar. It was a risky move, but it allowed me to develop as a writer in ways that would never have been possible had I stayed. 5. Which technologies do you believe are having the most profound effect on how we communicate today? It’s a difficult question to answer because none of the new technologies have been around long enough for their likely long-term effects to be clear. It’s easy to be struck by the linguistic novelty that accompanies a new medium of communication, but which of its features are short-term instances of fashion and which are going to have a longer life is never easy to say. Some of the technologies that were around in the 1990s have now completely disappeared. A new development, such as Twitter, can change its character overnight: users’ linguistic responses to the prompt ‘what are you doing?’ in 2006 changed noticeably in 2009 when a new prompt was introduced (‘what’s happening?’). When [an audio Internet and a sophisticated automatic translation] become a daily reality, and we have a ‘Babel fish’ to interpret between any language, as in The Hitchhiker’s Guide to the Galaxy, now that will justify the adjective ‘profound’. 6. Which of your professional achievements do you believe will have the most lasting impact on the field of linguistics? I have no idea. I imagine, judging by the messages I receive, that my ‘popular’ writing would fall into this category, as many people tell me that they took up the study of linguistics as a result of reading one of my books, and who knows what amazing achievements will result from their contributions to the subject. As an applied linguist, I hope my work in clinical linguistics, educational linguistics, internet linguistics, and theolinguistics will have some sort of lasting impact, but you’ll have to ask others about that. Both. I devote a whole chapter to this in my latest book, Making a Point: the Pernickety Story of English Punctuation. I found it fascinating to explore the history of the comma to see why this became an issue. Today, usage remains divided between publishing houses, so we are likely to be faced with the choice for some time to come. Personally, I like to use it, as I think it helps to show the parallelism between the adjectives in the noun phrase and better reflects the prosody if the sequence is read aloud: to write the tall, dark, and handsome man places tall and dark on an equal footing, whereas the tall, dark and handsome man doesn’t. But there are arguments both ways, which have been around since the 18th century, so I can’t see them being resolved any time soon.